Dropped the keys in the boot as you closed it? 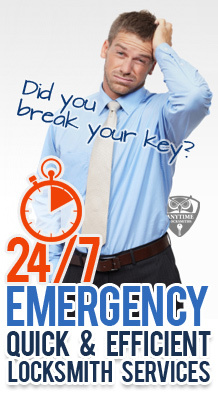 Anytime Locksmiths provide an emergency locksmith service that can help 24 hours a day 7 days a week. No job is too big or small for your local emergency locksmith. Top locksmith training combined with the best locksmith tools enable our technicians to pick any lock from simple cylinder lock to a complex electronic coded lock. Locksmiths take pride in almost always providing a non destructive entry. We understand what it means to be stuck outside waiting to gain entry, and we do our utmost to minimise your wait. Our rapid call out response is usually within 30 minutes both during the day and night. Rain or sunshine, our local locksmiths provide 24 hour locksmith service including roadside assistance by auto locksmiths if you are stuck with a broken car key, jammed lock, auto responder problems or any other car lock and key issue. Our technicians are able to supply and fit locks of all types for doors, windows, filing cabinets, safes, garages and mailboxes. We prefer insurance approved locks and can recommend the best lock type that fits your needs. All locksmith work is guaranteed so you can be sure the work is done well. We require 100% customer satisfaction and periodically check up on the locksmiths to ensure this. Do you have UPVC windows or doors? We provide specialists in UPVC lock repairs and lock replacements for both window and door locks and can fit all British Standard locks. If you can't get your safe open, our Emergency locksmith service can help here too. Call us 0330 088 2969 on and a safe expert will be round to get your safe lock open. We can also offer rekeying if necessary and key duplication if you have lost your spare keys. Anytime Locksmiths' emergency locksmith service is your number 1 locksmith service for any emergency any time!